The results of my kitchen experiments. My boyfriend Andrew and I love leftovers. We will happily eat the same dish for dinner two nights in a row, and leftovers don't tend to last more than a day or two in our house. The fact that the remains of this meal have been sitting untouched in our fridge for a week says a lot about how we felt about it. It's not that this barley risotto was bad, we both liked it, it just left me a bit cold (which is actually rather ironic, because I see risotto as something warm and comforting). Lately, now that the weather here in Maryland is easing towards fall, I have been on a real risotto kick. In the past couple of weeks I have made Deb's tomato and sausage risotto (um, twice - like I said, I don't mind repeats) and lemon risotto, both of which were completely delicious. So when I saw this barley risotto in the September issue of Cooking Light, I thought it would be right up my alley and a nice variation on the classic arborio rice (plus I have had a bag of pearl barley in my cupboard for approximately 3 billion years). On paper, this dish seemed tailored to my tastes: I love roasted eggplant and tomatoes, basil, pine nuts, and, of course, goat cheese. What I didn't count on, and what I found out when I was tasting my risotto for seasoning, was that I don't really love barley. It is not offensive to me (unlike cream of mushroom soup or canned black olives), but I am certainly not going to join the barley fan club. Because I did love the combination of ingredients (except for that pesky main ingredient), I would try a different incarnation of this dish. I am thinking penne pasta tossed with the roasted vegetables (I would kick up the amount of olive oil used for roasting) and some of the pasta cooking water, then topped with the toasted pine nuts and goat cheese and an obscene amount of fresh basil. Or maybe I would roast the eggplant whole and puree it for a dip or the base of a pasta sauce. I also think that it would make a great pizza. Yes, there is definitely a good chance that pizza with caramelized onions, roasted eggplant, sun dried tomatoes, pine nuts, and goat cheese will make an appearance here on Crumbs. Even though I was not gaga over this dish, I still think that it is a good recipe. There are not many reviews yet, but they are all overwhelmingly positive. So if you like barley, give this recipe a try. As for me, I think it is time to accept that the leftovers are not going to be consumed, and that they are taking up valuable real estate in my fridge (food guilt alert - I hate throwing things out). If you have a recipe that you think could make me a barley convert, leave me a note in the comments. Preheat oven to 350 degrees. Place pine nuts on a sheet pan and toast, 5 to 10 minutes, until fragrant and golden (You can also do this in a dry skillet over medium heat, shaking the pan frequently, until toasted. This should only take a couple of minutes). Raise oven temperature to 400 degrees. Combine eggplant, tomatoes, 2 tablespoons oil*, 1/4 teaspoon pepper and a sprinkle of salt in a bowl; toss to coat. Arrange mixture in a single layer on a sheet pan (you can use the same one that you used to toast the nuts). 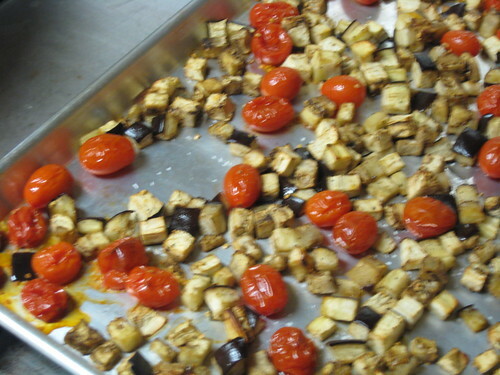 Roast for 20 minutes, until the tomatoes begin to collapse and the eggplant is tender. Meanwhile, combine broth and 2 cups water in a medium saucepan; bring to a simmer (do not boil). Keep warm over low heat. Heat remaining tablespoon of oil in a large skillet over medium high heat. Add onion and saute 4 minutes or until it begins to brown. Stir in barley and garlic and cook 1 minute. Add wine; cook 1 minute or until liquid almost evaporates, stirring constantly. 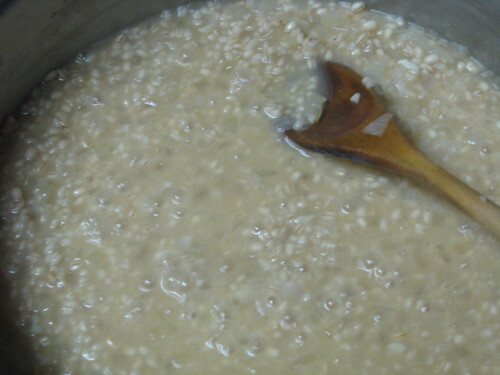 Add 1 cup broth mixture to pan, stirring frequently. Cook 5 minutes or until liquid is nearly absorbed, stirring frequently. Continue adding broth, one cup at a time, stirring frequently and making sure broth is absorbed before each addition (about 40 minutes total). Gently stir in eggplant mixture, and season with salt and pepper to taste. 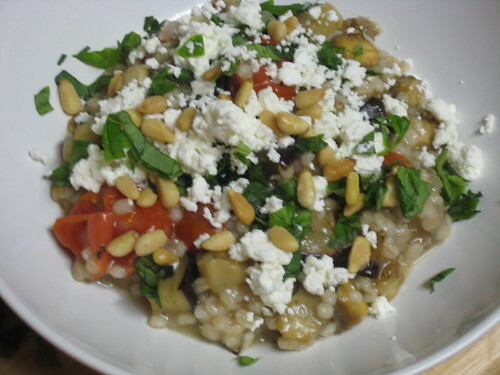 Spoon risotto into bowls and top with cheese, basil, and pine nuts. *If you are not worried about keeping this ultra light you may want to use an additional tablespoon or two of olive oil to roast the vegetables, they were a bit dry. I love to cook, and I love to eat. I am a cookbook addict, aspiring cake decorator, and unfortunate yo-yo dieter.